An Artist's Brainstorm: Put Photos On Those Faceless Ebola Suits : Goats and Soda Printers blew up. People took the photo stickers home. But in the end, art professor Mary Beth Heffernan succeeded in bringing a human face to the scary-looking protective gear. 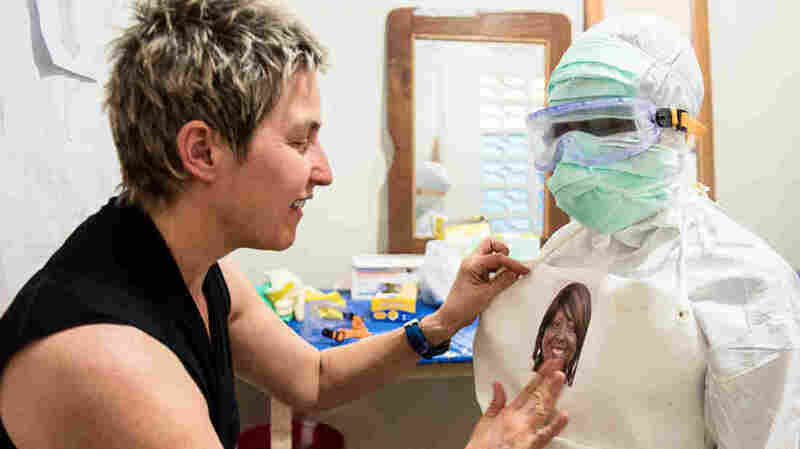 Art professor Mary Beth Heffernan puts a portrait-on-a-sticker on nurse Zoe Dewalt's protective suit. Mary Beth Heffernan shows Dr. Jerry Brown his image on the back of a camera. How often does this happen: You're listening to a news story describing some problem halfway around the world and you say to yourself, "I know how to fix that!" It's not your area of expertise. It's not a place you know. But you are sure that if you went there you could solve the problem. Los Angeles artist Mary Beth Heffernan is the rare person who decided to actually give it a try. Last summer, Heffernan, who is also an art professor at Occidental College, became obsessed with Ebola — particularly the images of the health care workers in those protective suits, or PPE as they're called for short. "They looked completely menacing," says Heffernan. "I mean they really made people look almost like storm troopers. I imagined what would it be like to be a patient? To not see a person's face for days on end?" "I found myself almost saying out loud: 'Why don't they put photos on the outside of the PPE? Why don't they just put photos on?'" "It's not a sophisticated response," she says. "It's almost stupidly simple." She explains: "This is in the spirit of social sculpture. This is part of that history of making art that's about action, about changing society." Soon Heffernan's kitchen table was piled high with printers to test and applications for more funding. But her biggest challenge was connecting to the people who run Ebola treatment centers. Heffernan photographs health care worker Martha Lyne Freeman. Massaquoi says Heffernan wasn't the first person to write him pitching some untested scheme. In fact, it was getting to be kind of a pain. "We've had tons of emails!" he says. "And I was like, 'Can you just stop writing me emails?'" But Massaquoi says Heffernan's proposal stood out. He'd worked in Ebola wards and the photos made so much sense. He wrote back immediately. Within a month Heffernan and a colleague were on a plane to Liberia's capital, lugging 12 enormous boxes of supplies. "Some guy that was on our flight actually looked at me and said, 'Are you moving here?'" she recalls, laughing. Right away they ran into snags. It was like a crash course in what can go wrong when people in one country try to dream up solutions for people in another. For instance, the electrical adapters that Heffernan had planned on using weren't the right kind. Three printers blew up. 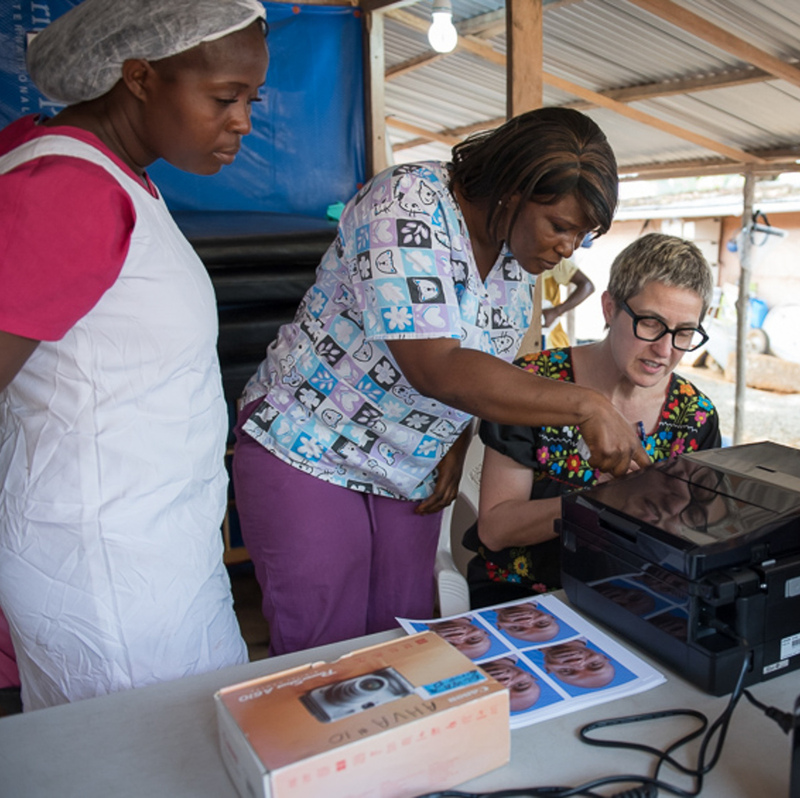 Heffernan prints photos at the Ebola treatment unit. At the first Ebola treatment center she worked with, the staff liked the photo stickers so much they kept walking off with them. "Some brought them home and put them on their refrigerator and their child's backpack. There was another who put the labels all over his car." It turned out that the staff had been doing really dangerous, really grueling work for months — at times without getting paid. And photos aren't easy to come by in Liberia. So sticker pictures seemed like a rare perk. Heffernan realized that in the future, she should bring regular photo paper along with the stickers, so everyone could be given a proper photo to take home. For all the hiccups, ultimately the project did start working. Jennifer Giovanni is head of infection control at a treatment center in a rural part of Liberia. She says the photos have made a huge difference — and not only for the patients. "I feel like I'm working now with other human beings instead of, I almost want to say, like white monsters or white zombies or something." As for Heffernan, she's back in Los Angeles — and working on bringing more photo kits to Sierra Leone.